The call is going out for volunteers for the annual Pancake Breakfast the morning of the 11th! PGK Alan Serafim will be leading the cooking, and needs 4-5 helping starting at 6AM…we will also need volunteers for serving and replenishing the tables all morning ….i am told that the most folks needed are after the 9 and 11 Masses. Please respond to when you may be available. 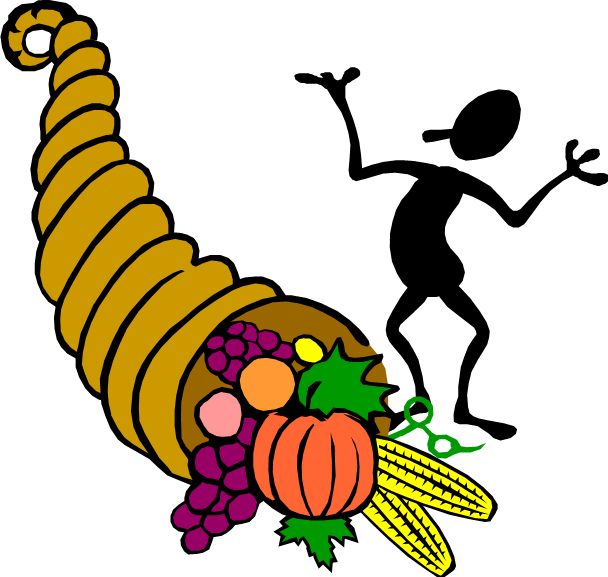 Announcements – Food and Life! 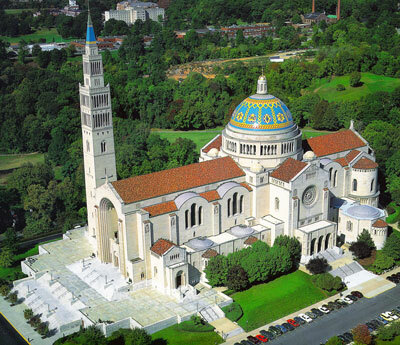 Sept. 10-11 is the weekend for us to help with food bag distribution after the Mass you attend. Bags, with labels affixed, are in the back hall left side closet. Also, if you are helping with the [pancake] breakfast, bring a stack of the bags over to MPH, people might pick one up after they munch on the pancakes! Thanks again for your help and it will be nice to have the Knights so visible in our Parish that weekend. Also, on the Respect Life Report, was the announcement of the Respect Life Panel Discussion, to be held at St. Bridget Church on October 1, from 9- 12 Noon, with coffee and light breakfast foods available at 8:30. All Knights are encouraged to support this pro-life ministry, as one of the pillars of the K of C is certainly standing in support of all life, from conception to natural death. Congratulations to our parishioners, Jim Ryan and Bruce Slough who recently were exemplified to the Third Degree of the Order. Please extend your congratulations to these worthy Knights! 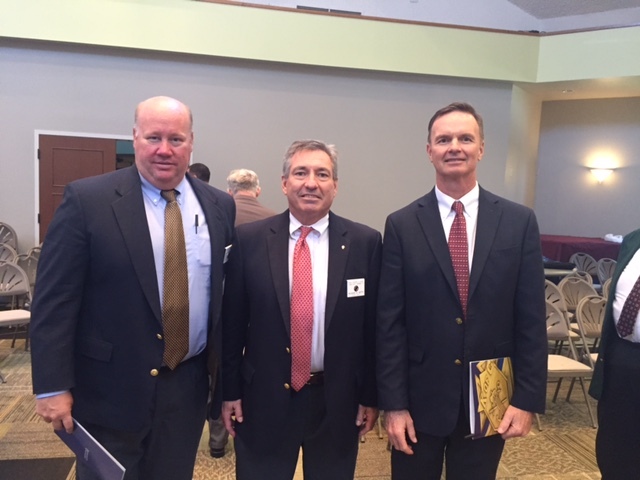 Pictured are Jim Ryan, Grand Knight Rick Witty and Bruce Slough. The Knights of Columbus encourages good Catholic men to join our ranks to serve our clergy, our church, our community and those in need. Come gather in support for all life on Respect Life weekend at St. Bridget Church. This seminar features excellent speakers that will challenge you, encourage you, educate you, and support you in your personal mission for life. All are invited! 9:05 The Jubilee Year of Mercy – Monsignor William Carr. Our pastor of St. Bridget Church will speak about the Jubilee Year and its call to all to have a profound respect for life from conception to natural death. 9:30 Stories of Abortion, Forgiveness and Healing – Kevin Burke, author and speaker, and Leslie Davis Blackwell, pro-life activist. Listen to the perspectives of two devout Catholics and how they are personally involved in helping those that have experienced abortion and are dealing with the sorrows and guilt from abortion, and their unwavering commitment to protect the unborn. 10:30 Mercy at the End of Life – Monsignor Carr. Special understanding, compassion, and care are called for at the end of life. Hear Monsignor Carr’s perspective on what we can do to support our loved ones on their journey home. 11:00 Building a Respect for Life – Olivia Gans Turner, President, Virginia Society for Human Life, will suggest how we individually and as parishioners can be more directly involved in building up a respect for life in ourselves and those around us. 11:30 Open Discussion – There will be time for discussion and questions for the speakers. For more information, please call Vicki Gazzola at 282-9511 or email Vicki@saintbridgetchurch.org. Monsignor William H. Carr, Pastor, St. Bridget Church. Monsignor Carr, a priest of 47 years, has lived a life of pastoral ministry in many parishes in the Richmond Diocese. He lives a life dedicated to leading parishioners in his care to a deeper relationship with Jesus Christ and lives dedicated to God. Monsignor Carr has been a vocal supporter for all life, including the unborn, the sick and the poor, and the aged and dying. Leslie Davis Blackwell. Leslie speaks openly as the Virginia co-coordinator for the Silent No More Awareness campaign, an international ministry helping women and men hurt by their abortion experience. She has shared her story of radical conversion from angry, pro-abortion feminist to pro-life activist in venues and media platforms worldwide, including the Supreme Court steps. She is the Communication Director for The Hosea Initiative, and serves on the Respect Life committee at St. Bridget Catholic Church, Richmond, VA.
Kevin Burke. Kevin Burke is a licensed social worker, Co-Founder of Rachel’s Vineyard Ministries and a Pastoral Associate of Priests For Life. Kevin’s presentations address the effects of abortion on men, couples and families and effective post abortion ministry for Clergy and Counselors. Kevin is the co-author of Redeeming A Father’s Heart – Men Share Powerful Stories of Abortion Loss and Recovery with his wife Theresa Burke and Fr. Frank Pavone. He has contributed to and authored articles on post-abortion healing. Olivia Gans Turner, President, Virginia Society for Human Life. The Virginia Society for Human Life (VSHL) is a non-profit organization advocating an end to abortion in Virginia and the United States. VSHL is the Virginia affiliate of the National Right to Life Committee. It was founded in 1967 and is the oldest pro-life organization in the country. The group has a political action committee, VSHL PAC, to support pro-life candidates for Virginia public office. Olivia is also the Director of the American Victims of Abortion (AVA). Registration is open for the 5th annual Catholic Men’s Conference! You can click here to learn more or to register. Early bird registration closes on August 31. After that date, registration will be available at the door for $50. Permanent Deacons who register by August 31 can attend for $30. The Conference will be held on Saturday, September 10th at the Double Tree Hotel in Williamsburg from 9:00am-5:00pm. The conference theme, “Fully Alive,” plays on Jesus’ invitation throughout the Gospel to an abundant life. As a man, husband, father, brother, and friend how is Jesus calling you to be more fully alive. Above all else, our culture values the freedom to pursue our own happiness, to choose whatever lifestyle, relationship, or path we think will make us the most happy. The invitation of Jesus is to consider this: our freedom exists so that we can give ourselves away. The paradox of the Christian life is that when we empty ourselves, follow Jesus, and participate in His life we become fully alive. Sean Forrest and Father Damian Ference will be the keynote speakers. Additionally, at the conference there will be several priests available for confession. We will celebrate the vigil Mass together at 4:00pm. And, this year, we will offer breakout session in the late morning. Hope you can join us again this year. It will be a great conference. Tour opportunities are available on Wednesday, September 7, 2016 from 10:00 a.m. to 4:00 p.m. Visitors will ascend the Tower elevator to the observation level where they can take in spectacular views in all four directions. There are no tickets or reservations to take advantage of this unique experience; visitors will be permitted on a first-come, first-served basis. 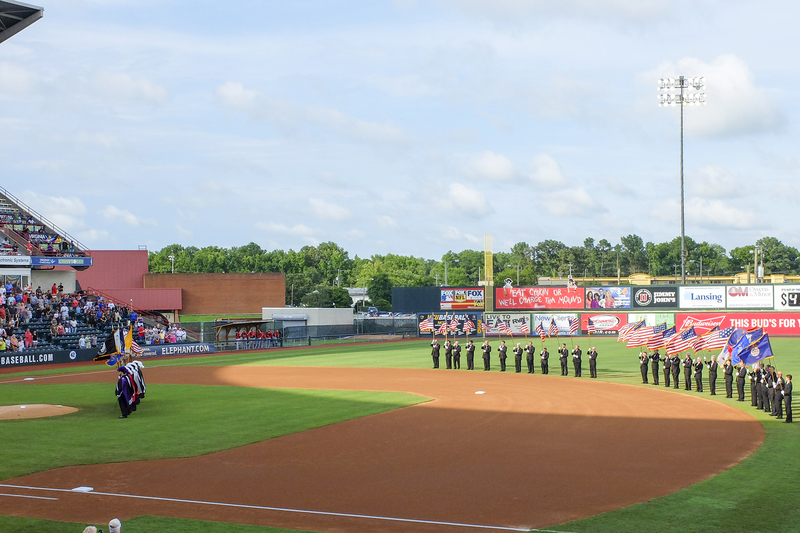 The Flying Squirrels presented Military Appreciation Night at the Diamond on Saturday July 30th. 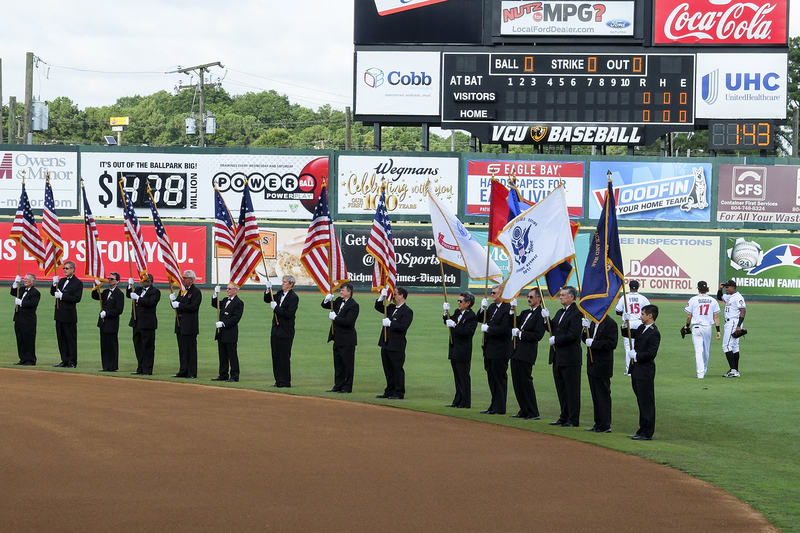 Over 30 Worthy Fourth Degree Sir Knights participated in a Color Guard Brigade onto the field to pay tribute to our Military. 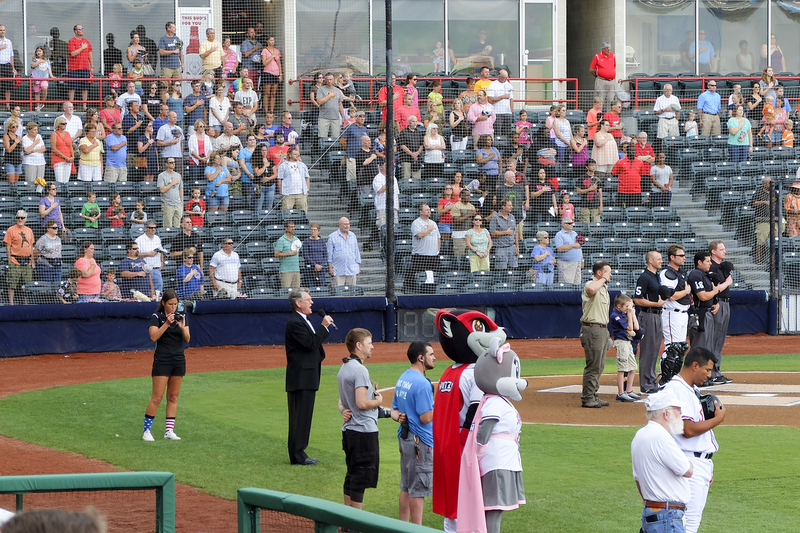 Worthy Vince Eikmeier sang the National Anthem. Please be aware of an upcoming opportunity to participate in a 2nd and 3rd Dual Degree Ceremony on Saturday August 27, 2016. The ceremonies will be held at St. Michael’s in Glen Allen. The 2nd degree will start at 8:30 AM and candidates will need to arrive not later than 8:00 AM. The 3rd degree will start at 11:00 AM and candidates will need to arrive not later than 10:15 AM. Please note that this is a great opportunity for current 1st degree Knights to advance to both the 2nd and 3rd degree in one morning. As a Council, those of us who have already achieved this advancement level recommend your taking these important steps toward full Knighthood. Please inform me ASAP if you are interested in this opportunity so I can inform our District Deputy of the number of Knights that will be attending. Also, any Knights who have attained the 2nd or 3rd Degree are encouraged to attend and support our brothers as they advance.